We just showed up at LG's IFA keynote, and LG Europe CEO James Kim has taken the stage. 11:09AM - LG has struck upon a new factor for product design: WAF, Woman Acceptance Factor. It's not just about the guys anymore. 11:11AM - Mentions the Chocolate, and LG's latest TVs that "look beautiful even when switched off. 11:12AM - And now welcoming Elmar Schuller, VP of red dot to talk more about design. 11:14AM - We can talk about the "quality war" or the "price war." And design quality helps you avoid the price war. Kind of preaching to the choir here, giving examples of cars and pasta. 11:17AM - Finally brings it around to LG. Record sales in Q2 2007. 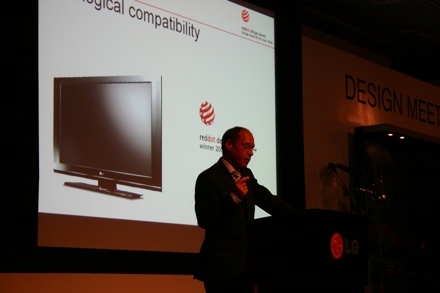 LG won design team of 2006. Changed from a "chaser to a challenger." Mentions the Prada as a "first" of its type. 11:23AM - Still talking about red dot, we'll let you know when things pick up again. 11:25AM - And here's LG's Matt Ryan, ostensibly to talk about products! 11:26AM - Talking about the integral role of design at LG, and how they're working to extend this concept throughout the company. The man's no Steve Jobs, kind of looks bored. 11:29AM - We're starting to see a "design" theme here. Still no products. 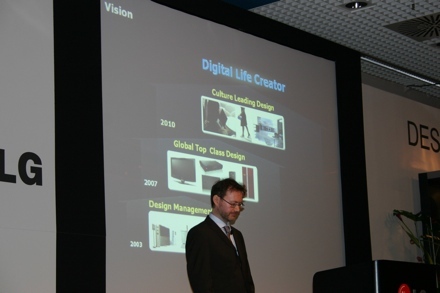 LG wants to be a cultural design leader by 2010. 11:32AM - Now showing a "movie" (more like a PowerPoint animation) of the "genesis of design art." Talking about the elements of design art, "the play of light, the line, the curve." We really could gag. Designart LCD TV "Circle." Speakers based on a wine glass. Receiver and subwoofer also feature circle elements, and "tension. 11:37AM - Now Neil Robinson is on stage to talk products. We couldn't be happier. 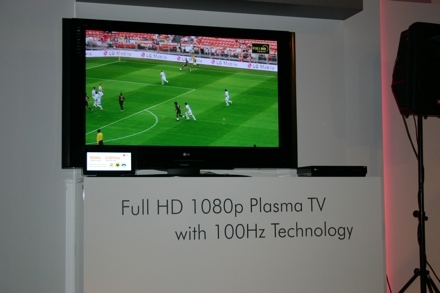 11:37AM - Starting with the 1080p 100Hz plasma TV. Announcing the PF95 in 50-inch and 60-inch versions. 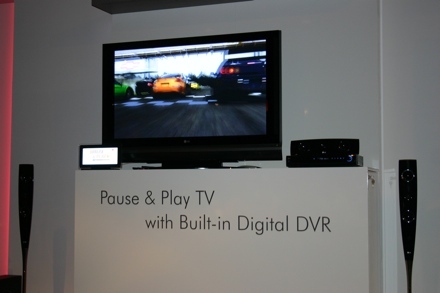 Also introducing the Pause & Play TV, the MPEG-4 HD iDTV. Two tuners, built-in DVR, LT75 LCD version, and PT85 plasma version. Introducing the "world's highest contrast ratio LCD monitor." 5000:1 contrast ratio. 20-inch L206WU and 22-inch L227WT. "World's brightest Ultra Mobile projector." HS101. 100 ANSI, 2000:1 contrast. 800 x 600, HDMI. "World's fastest external optical drive." With 6x Blu-ray burning, 3x HD DVD reading. 11:44AM - He's talking about award winners for 2007, including the BH100, and now he's done. Time for Q&A. When will we see a combo player with interactive HD DVD features? "HDi-supporting 2nd gen product will be released by the end of this year." They're talking about geeky European TV standards. Final question. How often does LG expect to phase in new design styles? "It depends on what product we're talking about. For phones it might be 2-4 times a year, for other products 1-2 times a year. We monitor trends, and we have a system in place that senses when a new design is needed and kicks off the design process." And that's it. Thanks for tuning in.